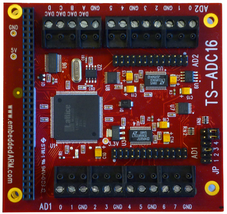 The TS-7300 with TS-ADC16, is the ARM 7300 equipped with a TS-ADC16 multi-I/O peripheral board. The TS-9700 provides additional analog Inputs/Outputs, digital inputs, digital counters and a digital output. •16 channel 16-bit Analog to Digital Converter. Each A/D channel has the following software programmable input ranges: 0 to +5V, 0 to +10V, -5 to +5V, -10 to +10V input, 0 to 10V input single ended or differential. •4 channel 12-bit Digital to Analog Converter. DAC outputs are 0 to 5V range. The TS 7300 is a product of Technologic Systems. More information can be found on the website: http://www.embeddedarm.com/products/board-detail.php?product=TS-ADC16 and their TS-ADC16 wiki page: http://wiki.embeddedarm.com/wiki/TS-ADC16. •RTAI real-time Linux: You can order an SD Flash card with a customized RTAI real-time linux installation including the 20-sim 4C target support software.